Just a bit of stitching. 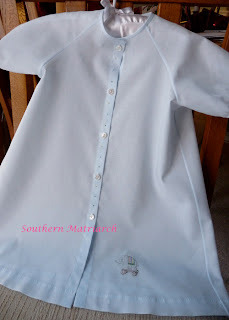 I sometimes let myself get caught up in a grand project when really just $10 worth of Imperial Batiste, $1 worth of floss, 10 buttons from my prized button basket, a back issue of Sew Beautiful magazine and a well aged pattern can make something very sweet. 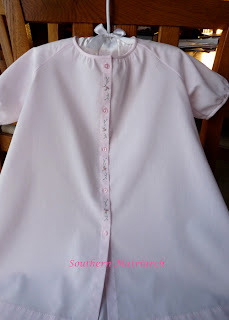 Jeannie B of the Old Fashioned Baby did a stitch along on her blog using Priscilla's Layette. I don't even know how many years I have had this pattern. I have pulled it out often when in the planning stages of a project but had never made it. I frequent an heirloom smocking and sewing forum that is running a Sew More challenge. Perfect time to pull out this simple pattern, some fabric from my stash and stitch with no deadline in mind and no pressure. First is Priscilla's daygown in pink Imperial batiste. I used View 2 for this gown. It is a tad more full by being gathered in the front. For a sweet touch I just embroidered some simple bullion roses, garnished with stem stitch vines and lazy daisy leaves between the darling pink buttons. For the second gown I used View 1 which is a flat front gown. This also is out of Imperial batiste but in blue. 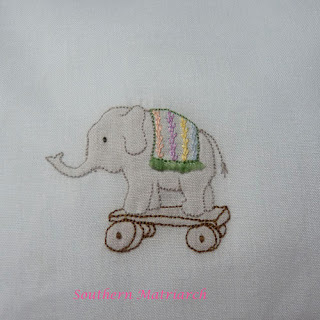 I found a shadow work elephant pull toy in a 2006 back issue of Sew Beautiful. He might not be my best work, his wheels are kind of wonky but I think he is cute. Next time I would make him larger. And the fringe on his blanket is "turkey knots"!!! I love me some turkey work. It is a well known fact. Between the antique buttons are just a few simple granitos in the same colors that are used in the elephants blanket. I do wish I had made them bigger, but oh well. My goal with these was just two simple daygowns. There is no lace at the neck or sleeves. Both have just simple embroidery and are made from a cotton/poly fabric that can be machine washed without a whole lot of concern. These are laying around the house gowns. These are not baby's coming home from the hospital, first trip to church or Great Aunt Nelly is coming to see the baby for the first time. Just everyday. All the same they are sweet. Love them both! The girl's vision is precious, your gown demonstrates that expensive fabric and lace are not necessary to create something beautiful. Thanks for posting your beautiful gowns. Don't think for one minute that you are not present in my family room every night as I stitch these turkey work bunnie bums.....I can hear your voice..." I love me some turkey work".......the gowns are precious! Those of us who have met you, know only too well how you love that turkey work! That little elephant is beyond precious! Martha, your gowns are beautiful!! You make me so happy to see such lovely garments made from my patterns. Thank you! Thanks everyone. I enjoyed making these sweet gowns. Oh, so pretty! The details are so pretty to see. I wish you would do a sew-along!!! Oh, these are just beautiful! Your embroidery is gorgeous and that Imperial batiste is so soft and easy to take care of that these will be well worn and loved. I plan on making a couple of little nightgowns out of that fabric for my friend's baby due at the end of May. Will these go in your Grandmother's Hope Chest? Those teeeny-tiny bullions are pure perfection, too. 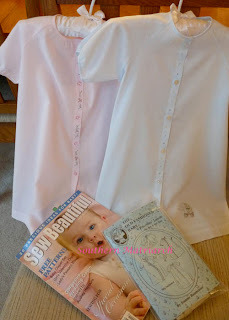 These are both precious little day gowns that will someday be worn by a very special wee one. Thank you for the sweet birthday wishes & seriously, my door is always open for a visit from you! Thanks everyone. These were simple and gratifying to do. Mary you could more than do these after that christening gown. Karen, thank you and yes these are going into my hope chest. Retta, yes it is widely know how much I love turkey work. LOL. I guess I could be known for worse. I probably AM known for worse.